The day after the day before. Thanks to all for your messages of concern and support. I can confirm that there was no damage to either Sweet Cheeks or The Copics throughout the production of yesterday's post! I had to go to the Doctor's for a new patient check this morning. Boring, but necessary, the usual stuff. Do I smoke? Does that include what comes out of my ears? Do I drink? Occasionally, quite rarely, which got me a bit of a funny look. Again, doesn't she read my Blog? I'm an athlete and train regularly in The Bat Cave so need to be in full control of my colouring mediums. Do I try and eat three meals a day? Oh Yes! I make sure I have a doughnut for breakfast, a cupcake for lunch and some pie for tea. I'm so good, I even have a vegetable snack (cocoa beans) before bed. Do I exercise regularly? Hello! How many times do I have to ask? Does she not read my Blog? She's obviously never experienced me getting from one side of the house to the other when Sweet Cheeks and Copics are alone in the same room. Really, are these trick questions? 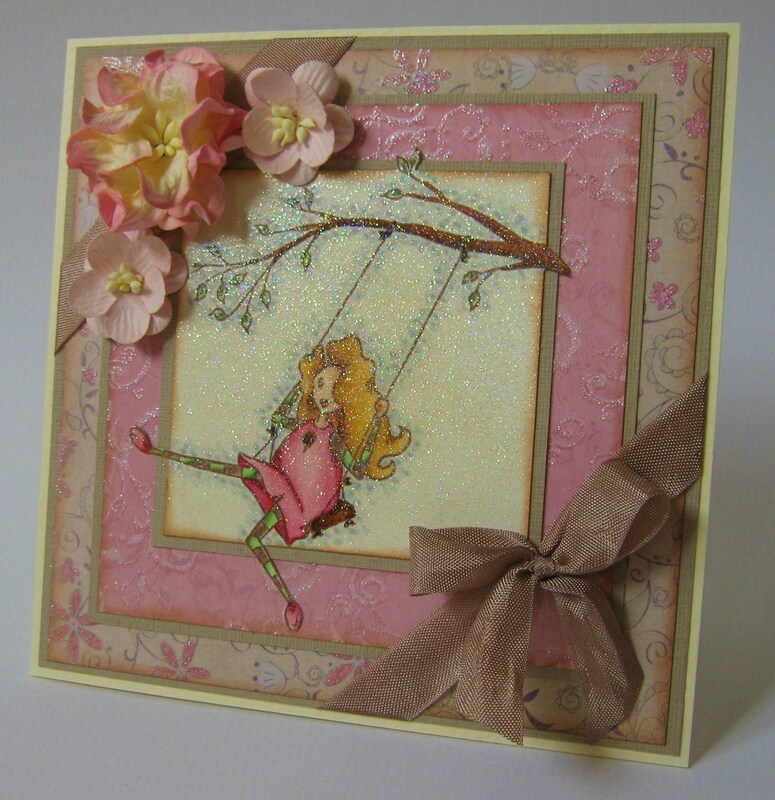 Anyway, I made this card last night, for the All that Glitters Challenge at MMCS, whilst 'in training'! I not sure about it, but it's growing on me and boy, did I have a good time on the fumes from my glitter (aka happy) spray. Ooh, good job she didn't ask about that, what exactly do they check your 'sample' for...? Ha ha ha ha ha ha ha. I just love visiting you, you make my day, and YOU keep my Bloodpressure down, so thank you. Hi Faye and Sweet Cheeks - Just love your posts - really make me laugh as usual. Very pretty card, and also the one below - love clocks. And - what a fab new blog background. Have been away for a few days so just catching up. WEll Hello... she should have read your blog and then she would have had the real scoop!! By the way fab card!! Love the soft colors with the totally cool image!! Very pretty dps and layers!! Beautiful card I just looooove it and you did make me smile with your adventures never a dull moment with little ones lol. Oh my goodness - how could you not be sure about this card - it's totally fabulous! The colours, the layout, the image - everything about it is just gorgeous. Another fab insight into fluffworld! Did you get that beautiful pearlescent look with glitter?! Must try, it looks fab! LOL!...Faye I soooo love reading your posts...and so pleased the copics survived hehehe..
another beauty hun..and fab dp's too..
Lol your post has put a smile on my face, beautiful card, I like the flowers and the big bow, glad the copic's were ok. have great Easter. Lots of lovely sparkle on your pretty card. Love the quirky image and the beautiful blooms, Fluff. BTW they check your sample for choklit to see if you are an addict! Doesn't she read your blog? This is beautiful Faye! I love the softness and the girliness! The flowers and bow are perfect! Love the glitter! Glad you had fun with it! Your post is too funny! Hi FayeJust love your card like the double borders so to speak.Had to smile at your visit to Drs been there too. Enjoy Easter with your family. Ha! Ha! You crack me up! I have a bit of old rope in the garage, that you can use to tie Sweet Cheeks to a chair - I used it all the time when my girls were younger. I'm pretty sure it's not illegal!! STUNNING card - if you let me know what glitter you used, I will courier the rope to you, ASAP!! glad all ended well with copicgate!! Love this glitterly card! It cheers me up (and so does your real-life-soap!! hihi..)!! It's a masterpiece! Over 100 years people aren't exposing paintings anymore, but there will be a card-museum, with an extra gallery dedicated to you!! You do make me laugh hun, lol! Love that card...the glitter spray looks really nice, might have to try that soon! Thanks for playing along with our All That Glitters Challenge at MMCS and hope to see you again soon! *lol*!!! That is truly a beautiful card sweetie! Love the glitter and the soft colors! Oh Faye what a fabulous post I couldn't help but giggle, but I so love your card that image, the colours and design look super and after seeing the wonderful effect of that glitter I think I must treat myself to some. Gorgeous card! Lovely and elegant :-) Take care, and happy easter!